When you find a book that makes your child laugh from the pit of their tummy you know you are on to a good one. This book did exactly that and so of course I ended up laughing just as much. Open Very Carefully is a bedtime book that has been gate crashed by a crocodile who has got itself stuck within the book. He tries his best to escape and with the help of the reader (who can try and shake the book) the crocodile tries to find the best way to get out of the book. He tries to eat letters, swallow whole sentences, but can he find an exit route? Normally M loves books that involve interaction but usually that means lifting flaps or feeling textures. This is different because she had to move the book backwards and forwards, to shake the book and at the end to peek through the pages. In fact she kept asking to get to look through the hole in the book so many times. Each of these actions made her laugh so much, it was adorable. The illustrations are good throughout with large detailed pictures of the crocodile. The text is printed in patterns across the page rather than the normal lines of text. At 19 months old M loves it now but I can just see this book growing into a huge favourite of hers. So much so that I have ordered the book from Amazon already as it will be a sad day when we have to return this to the library. 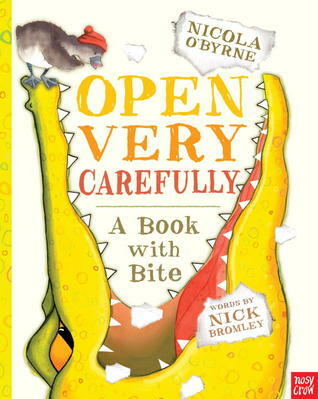 Love the sound of this, interaction makes books far more interesting for little ones! !